All around the world, entrepreneurs are creating thriving businesses. In London, Josh Babarinde created Cracked It, a social enterprise that trains at-risk youth to repair cracked smartphone screens, giving them an alternative to crime. In Seoul, Yeram Kwon is transforming the CPR training experience with improved, smarter manikins through HeartiSense. And in Israel, Oded Ben-Dov created Sesame Enable, the first touch-free smartphone designed for people who have limited or no use of their hands due to disabilities. As a company created by two graduate students in a garage, we know just how powerful an entrepreneur with an idea can be. We also know there’s more that companies, governments, and communities can do to help those entrepreneurs succeed. 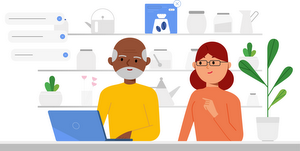 That’s why we created Google for Entrepreneurs nearly four years ago—to support startup communities around the world and connect entrepreneurs to resources and to each other. This week, we’re excited to participate in and sponsor the Global Entrepreneurship Summit, hosted by President Barack Obama and the U.S. government, building upon summits previously hosted by the governments of Turkey, the United Arab Emirates, Malaysia, Morocco, and Kenya. The summit showcases entrepreneurs and investors from around the world who are creating new opportunities for investment, partnership, and collaboration. Our CEO Sundar Pichai is speaking at Friday’s closing session, and a number of other Google leaders will be there to discuss the state of entrepreneurship around the world and ways that we can all support startups and encourage innovation. Helping entrepreneurs succeed also means building and investing resources in the communities where they live and work. That’s why Google for Entrepreneurs partners with more than 50 organizations worldwide, and runs six Campus spaces—in London, Tel Aviv, Seoul, Madrid, Warsaw, and São Paulo—where local entrepreneurs can work and learn. Altogether, we work with entrepreneurs in 125 countries, who have raised more than $1 billion in funding and created 5,000+ new jobs. Our support of the Global Entrepreneurship Summit is another way we hope to help entrepreneurs build and create the technology that will shape our future. To the 1,500 attendees joining from around the world, we warmly welcome you to Silicon Valley and hope to meet you! If you’re attending the Summit, please stop by the Google for Entrepreneurs lounge, where you can sign up for 1:1 mentorship from dozens of Googlers and industry experts, explore product demos, and more. We’re also hosting an interactive portal experience to connect attendees from the event to entrepreneurs around the world at Campus London, Campus Seoul, Centraal in Mexico, and in Iraq and Afghanistan. And for those that can’t join us in person, you can catch the action via live stream.